2 Strand Sterling Silver Bead Necklace by Navajo Artist Ester Reano. This Beautiful Necklace is 32 inches Long with Round and Marquise Beads. 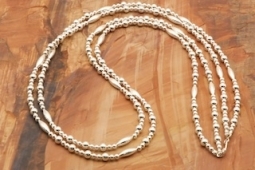 2 Strand Sterling Silver Necklace is 32" long.